We recently shared the amazing work that Mike Wabro undertook to remove the music from the mono master of Brief Encounter with an extended Podcast Extra Interview where Mike explained the trials and tribulations and how he achived this with the very careful use of iZotope’s Spectral Repair module. I really enjoyed watching the fruits of my labour on Brief Encounter tonight. 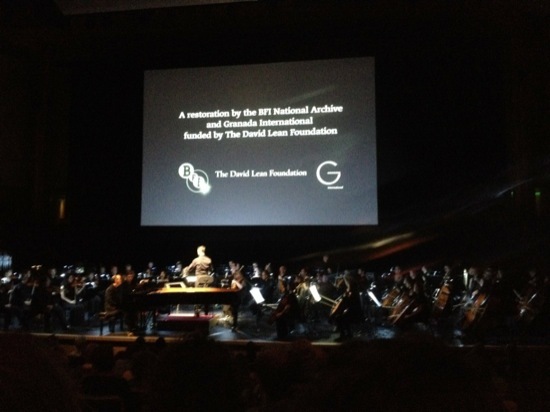 Quite a different & enveloping experience hearing the score played live by a top orchestra. I can highly recommend it. A great evening hearing the London Philharmonic Orchestra perform the score to Brief Encounter that we so painstakingly removed from the the film, note by note, instrument by instrument. You may remember that the brief from the client was to produce a music free mix of the David Lean classic Brief Encounter so that the London Philharmonic Orchestra could play live in sync with the film for 3 special performances in August this year. But the problem was that there was no copy of the film without music, so Mike had to develop techniques to remove the music without impacting on the dialog at all. Mike Wabro has let us have some before and after examples which are still ‘work in progress’ he still has some work to do as there is still the odd note showing or some words still needing some work on them before the live performance. Thanks Mike for being willing to share your work whilst you are still fine tuning. There aren’t many people who would share their work whilst they are still refining it, so thanks Mike for being so open. You can book tickets on the South Bank Centre’s web site. It is also hoped to be able to tour the work around the world in due course but as yet we do not have any dates for this. We would like to thank Mike Wabro’s clients for giving us permission to describe this process in detail and for permission to enable you to listen to two clips before and after Mike has worked his magic. Mike’s work has been completed on behalf of ITV Studios Global Entertainment and Park Circus Films. Sound Services supplied by Nick Pocock & Mike Anscombe of Deluxe Media at Synxspeed House in Denham, with the sound editorial help of Steve Felton of The Sound Design Company & music removal restoration services of Michael Wabro from Audioinsight.